Tory Island is a remote island off the coast of Ireland. Separated from County Donegal by a little more than seven miles of ocean, it is the last remaining part of Ireland to have a King. Tory is known for it's art, culture, scenery, and mythic past. According to the stories, Tory used to be home to the Fomorians-- massive one-eyed giants with a thirst for human blood. According to legend, Balor, the king of the Fomorians, lived in a gigantic fortress on Tory Island. He had locked his daughter Eithne in a tower, because of a prophecy that said he would be killed by his own grandson. 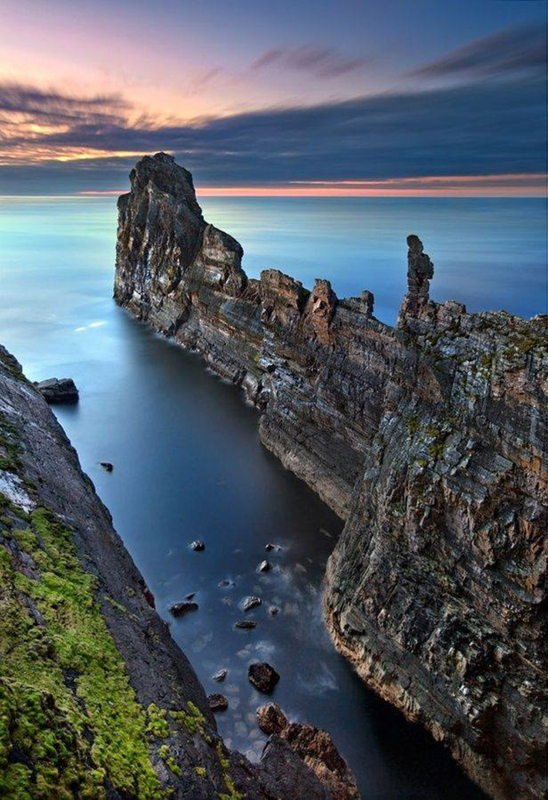 Balor did end up being killed by his grandson Lugh, the son god, but the ruins of the fortress where Eithne was supposedly imprisoned stands on Tory Island today as the Dún Bhaloir, a narrow, rocky natural stone wall that juts out dramatically into the sea. Ancient legend aside, Tory Island's history is defined by the arrival of Colm Cille, or St. Colombcile. Colm arrived on Tory sometime in the 6th century, prepared to spread Christianity. He encountered only pagans, but in a surprising turn of events, there was no hostility from either side, in fact, an Islander named Duggan asked for Colm's help. Tory was being raided by pirates all the damn time, and Duggan was, understandably worried about trifling things like his home, family, life. Colm was so impressed by this man who took the initiative to share his problems, he declared Duggan king of Tory Island. He told Duggan to challenge the pirates. Duggan did so, and the pirates never bothered the island again. Impressed, the entire island converted to Christianity, and Colm built a monastery. Colm also gave Duggan a pot made of magical clay that drove all the rats out of Tory. While many people may be skeptical of 'magical clay', there are no rats on Tory, and the pot rests in the possession of the Duggan family to this day. St. Colombcile's declaration of kingship became one of the island's most cherished traditions, a tradition that carries on to this day. In modern times the king is elected, and his kingly duties include things like greeting tourists at the docks, seeing tourists off, maintaining the cultural integrity of the island, and politely refusing the Irish government's offers to resettle the people on Tory on the mainland. The current king of Tory is one Patsy Dan Rogers. Rogers, like many of the inhabitants, is an artist. Art is another thing that Tory is famous for. The Islanders have a style of 'primitive painting' unique to the island. It was started in the 1950s when artist Derek Hill stopped by, and was saucily told by local James Dixon that he, Dixon, could paint much better than Hill. This was the beginning of a beautiful friendship, and the beginning of a new school of painting devoted to capturing the beauty of island life. You can see the contents of the local art gallery here. Today, Tory is a summer home for artists, and a short stop for tourists. The permanent population is rapidly shrinking in growth, with only four children being born on the island in the last eight years. The Donegal government has, more than once, offered to resettle the islanders on the mainland, but the few islanders that live on Tory can't be bought, and remain faithfully on the island.